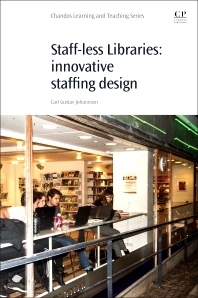 Staff-Less Libraries: Innovative Staff Design considers the challenges of this approach, its pros and cons, identifies international experiences, and discusses best practices. It presents a step-by-step approach to implementing a staffless library and/or services, and seeks to inspire professionals to share experiences and optimize their library. Staff-less public libraries, enabled by technological developments, represent a significant and innovative aspect of the development of public libraries. The concept radically enlarges the availability of user access to public libraries. Some Danish public library branches have, for example, increased their weekly opening hours from 20 to 80 hours per week. In Denmark, the concept has been quite successful, increasing the number of staff-less libraries from 81 public library units in 2011 to 260 in 2014. From a longer view, however, the staff-less library concept contributes to the modernization of public libraries by further opening the library. Many library professionals have been surprised by the near absence of vandalism through the staffl-ess opening hours. According to the latest trend, the staffless library model is gradually moving from thinly populated rural areas and suburban neighborhoods to urban contexts. This book explores the concept, hence furthering the debate. What Is an Open Library? Carl Gustav Johannsen is Associate professor in Library and Information Science at the University of Copenhagen. Previously he was Director of the Research School of Cultural Heritage; 1999-2008; and Head of Department of Library Development, Royal School of Library and Information Science. His research focusses on topics related to innovation and service development in academic, public libraries and special libraries. Presently, his research interests among others concern the future role of public libraries, in particular, related to the staff-less library concept.